Universal design - the concept of making things usable, easy and accessible for everyone - has a tendency to be mistaken for the American Disabilities Act. While both improve quality of life for people with disabilities, they aren't exactly peas in a pod. Look at it this way: ADA compliance would be a church adding a ramp next to the stairs leading to an entrance. On the other hand, universal design would treat the same issue by removing the stairs and replacing with a gradual-rise entryway to give everyone the same access. To put it simply, universal design is less concerned with meeting a bare minimum mandate and more focused on incorporating the needs of all people from the beginning stages of construction. There is actually a reason that short, stiff carpets and hard surface floors are found in most public buildings. If you use a wheelchair, you know how difficult it can be to push through even slightly plush carpet. 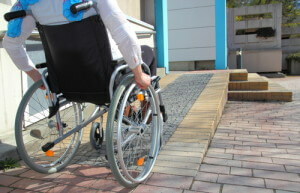 Wheelchairs, handcarts, strollers - they are all easier to operate on hard surfaces. Room thresholds are most common in transitions between areas of carpeting and hard surfaces, and those lips can be not only difficult, but painful to maneuver over. Sticking to a consistent flooring style and removing those thresholds can make a huge impact on ease of maneuvering an interior. An hour of freely moving around in the water gives people with severe arthritis, muscle atrophy, and more a way to recover and live a significantly more pain-free life. This is why an increasing number of hotel pools have accessible chairs on metal arms by the side of the pool. No, they aren't actually for sitting and reading in the water! My grandmother had horrible arthritis in her wrists, and after months of complaining, my dad changed all of her door handles from knobs to lever handles. The difference it made for her to be able to access her own home was unbelievable. Knobs, while being visually more appealing, require quite a bit more arm and wrist torque to move the bolt. Lever handles require both less force and overall motion. Tablets, eReaders, smartphones, and more have shortcuts to increase font size easily - another great example of subtle universal design. While my eyes have no issue with smaller fonts, when my mom uses my Kindle, she bumps the font up to make it easier for her. This is the same principle behind why Netflix, YouTube videos and more all now have captioning built in. 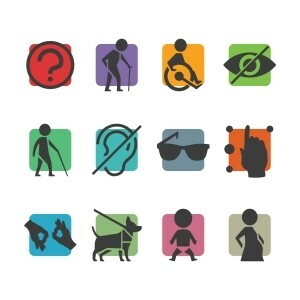 Disability or not, these features can make life easier. These are only a few of the countless ways modern interiors have been influenced by the concepts behind universal design. Our hope for the future of architecture is accessible design that is all-inclusive from the beginning - not a reaction to a forced mandate.